"It is going to be special," Cole told NHL.com. "I grew up going to games [at Michigan State] after moving to Lansing [from Pontiac] in 1976. It's always been a cool place for me. Obviously, having the opportunity to play for Michigan State four years was such a great opportunity for me. It'll be fun going back; I had a lot of good memories there and love the university. It'll be fun to coach there." Prior to turning pro, Cole was a four-year letter winner at Michigan State from 1985-89, producing 69 goals and 163 points in 180 career games. He was part of the squad that captured the 1986 NCAA Division I Men's Ice Hockey championship. The Spartans, coached by 2014 U.S. Hockey Hall of Fame member Ron Mason, won the national championship following a 6-5 triumph against Harvard University in Providence, Rhode Island. "We had 11 freshmen on that team and not much was expected of us after graduating one of the better teams to ever come out of Michigan State," Cole said. The 1984-85 team at Michigan State finished with a school record 38 victories in 44 games but dropped a 6-5 decision to Providence College in the quarterfinal round of the NCAA tournament. "We were a little bit of an underdog to start the [1985-86] season with not much to lose, but I remember how Coach Mason built it along and was patient early," Cole said. "We all had different roles and everyone fit in. From a team aspect, it was a pretty good experience for me and the players from that team [in 1985-86] are some of my best friends today. It was great." Cole received the Big Ten Medal of Honor as MSU's top student-athlete in both scholarship and achievement in 1989. He was named to three Central Collegiate Hockey Association All-Academic Teams and twice served as an alternate captain for the Spartans. College played an important part in his life. "I think I benefitted from the maturity aspect of being able to handle schoolwork and a Division I sport; balancing that kind of helped a lot of guys grow up and mature," Cole said. "Facing the type of competition we saw every day in practice when we showed up was also big. We had a lot of NHL draft picks on our team and had to battle every day to be in that mix, playing against older and stronger guys." Cole was named most valuable player at MSU his senior season and graduated with a degree in finance. He received the 2013 Distinguished Spartan Award at the Michigan State men's ice hockey team banquet last April. Cole acknowledged he still keeps in close contact with several players from that national championship team, including Kevin Miller, Chris Luongo and Dee Rizzo. "They are all doing well," he said. Cole credits Mason for the success he's had as a player and now coach. "Just being a part of the lineup every day at Michigan State, getting the coaching and the training was huge for me," Cole said. "Coach Mason was great. He was hard on us, but in the right way, and we respected him a lot. He was demanding, and we wanted to live up to his expectations and the challenges he gave us. For me, it was just a great four years. When I eventually reached the NHL, I was a more mature player and knew how to work and how to make myself valuable to my team." Mason, born in Canada, became one of the most successful coaches in American college ice hockey history, working the bench for Lake Superior State University (1966-73), Bowling Green State (1973-79) and Michigan State (1979-2002). He won two national titles: an NAIA championship in 1972 with Lake Superior State, and the NCAA championship in 1986 at Michigan State. He finished with a collegiate-record 924 wins, a mark that stood until Boston College's Jerry York won No. 925 on Dec. 29, 2012. Cole was selected by the Winnipeg Jets in the sixth round (No. 123) of the 1985 NHL Draft. He appeared in 318 NHL games from 1989-96, including stints with the Jets, Tampa Bay Lightning, New Jersey Devils, New York Islanders and Chicago Blackhawks. He was a member of the Devils team that earned their first Stanley Cup in 1995. Cole can sense the impact each Winter Olympic event has had on the young American athlete and is proud to be a part of the ongoing effort by USA Hockey. "I watch a lot of hockey with my two daughters and there's always two or three guys on almost every NHL team who have come through the program; I always point out if I coached a player," Cole said. "The first question asked when we heard the players for the 2014 U.S. Olympic team was, 'Dad, did you coach any of them?' I told them that there weren't any guys I coached on this year's team but that there may be a couple 1994 birth years in the mix at the next Olympics if NHL guys are still in it. 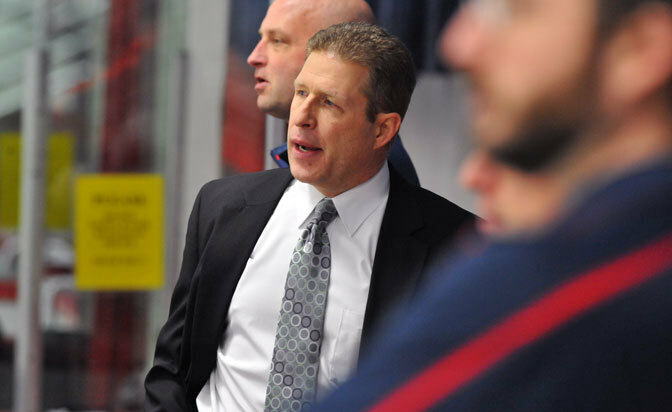 "That's one of the things about coaching in the program; the level of talent within USA Hockey is good enough where guys are having an impact in the NHL or Olympics at some point. It's a pretty interesting and rewarding position to be in."